How and Where to Buy Tradjenta Online? Our Canadian International Pharmacy offers Tradjenta at an affordable price. A valid prescription is required. Canadian Pharmacy World carries brand and generic medications from Canada and other countries around the world. For more information and further details, please call customer at 1866-485-7979. Are there Alternative Names for the Brand and Generic Tradjenta? The brand Tradjenta comes from Canada and India also called Trajenta manufactured by Boehringer Ingelheim. What is Tradjenta used for? 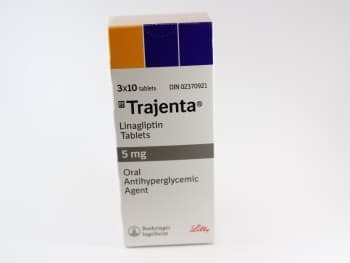 Tradjenta (Linagliptin) is a prescription oral diabetes medication that helps to control blood sugar. Linagliptin is used with a proper diet and exercise program to treat type 2 diabetes. This medication works by increasing the levels of incretins. Incretins are natural substances that help to control blood sugar by increasing the release of insulin after a meal. They also decrease the amount of sugar made by your liver. Are there any Precautions and Drug interactions for Tradjenta? You should not take Tradjenta if you are allergic to Linagliptin or if you have any other allergies. Before you start taking this medication, talk to your doctor about your medical history and about all the medications you take including OTC and herbal medications. You may experience blurred vision, dizziness or drowsiness due to extremely low or high blood sugar levels. Limit your alcohol intake while you are taking this medication as it can increase you risk of developing low blood sugar. This medication should only be used during pregnancy if it is clearly needed. It is unknown if Tradjenta passes into breast milk. Tradjenta should be stored at room temperature away from light and moisture and out of reach of children and pets. This medication should not be stored in the bathroom.